This week marks the tenth anniversary of the U.S. invasion of Iraq — a war that started with solid public support, but ultimately became a politically-divisive issue. A survey of veterans conducted during the summer of 2011, about 8 years after the war began, found that that less than half (44%) of those who served in the past decade’s conflicts in Iraq and Afghanistan thought that the effort in Iraq had been worth it given the costs to the U.S. vs. the benefits. Half of those surveyed said it was not. 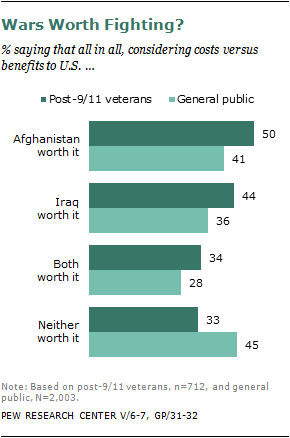 At the time of the survey, the percentage of veterans who served after the Sept. 11, 2001 terrorist attacks on the United States who thought Iraq was worth it was higher than that the general public (36%). A more recent survey, conducted March 14-17, 2012, asked only the general public whether the decision to U.S. military force in Iraq was the right one: 44% said it was wrong and 41% said it was right. The Iraq War got less approval from older veterans in the 2011 survey: 35% who served before Vietnam and 36% who served during it said Iraq has been worth fighting, compared with 44% of all who have served in the military since Vietnam.